...it's been four months since my last haircut. Here is a scenario. You have money in your bank for the first time in about two months. What do you do? What do you do? Am I the only person who, when buying a new outfit, often repeats the phrase that somehow makes it all okay... 'I can wear it to work!' Honestly, if I could get a job in which wearing party dresses was okay, I'd never need to stop shopping. Ever. And that's not including my little excursion to Primark (cute navy shirt dress that I'm going to put heart buttons on), Dorothy Perkins (ugly-cute yellow skirt that I adore and adorable patent pink flats) and New Look (dress I've wanted forevs and somehow squeezed into the only one left - a size ten!). And now? Ebaying half my wardrobe so all this new stuff can fit in there. *Note to Mothers who may be reading this. I sent almost all that stuff back. Honest. Maraschino Cupcakes: A wondrous invention. Sometimes I invent food. Not a lot, but sometimes. Like the time I invented the Land of Chocolate cake. I haven't made it yet, but it will be AMAZING. But, yeah. Food invention. Does anyone else do this? The food I invent tends to be cake-based, because I really like cake, but not always! This time, though, it's cake. Yep. 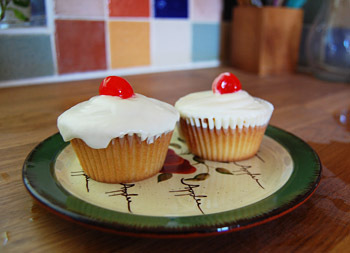 I love maraschino cherries, so I decided to make a cupcake version. 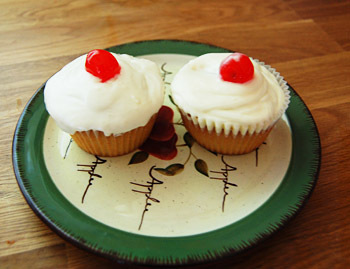 But as maraschino cherries traditionally go in cocktails, the cupcakes had to be alcoholic in some way. Therefore, almond cupcakes with an amaretto and cream cheese frosting. OM NOM NOM. Preheat oven to 160 C. Line a 12-hole muffin pan with cupcake cases. Put all ingredients in a large bowl and beat with an electric mixer until batter is very light and fluffy. Dump in cases. Bake for 20 minutes until golden, and firm and springy when you give them a little prod. Add the cream cheese in one go and beat until it is completely incorporated. Turn the mixer up to medium-high speed. Continue beating until the frosting is light and fluffy- for at least 5 minutes. Pipe frosting onto the cakes and then top with a maraschino or cocktail cherry. A GLACE CHERRY IS NOT THE SAME THING. So, as I mentioned, June was the busiest month in existence. It's telling that May - when I was attempting to revise, and therefore procrastinating a LOT - had double the entries than June, when I was genuinely busy. Here is what happened in June: I revised for three days. I did an exam for one day. I went on holiday for five days. I entertained Americans for eight days. I worked at my new job for four days. I went to Glastonbury for five days. And I STILL had time to read five books. After complaining about not working for what seems like ages, I feel like I should talk about that briefly. So, I have a job! And it's going really well. I like the people I work with. I've not been there that long, as I started and then had Glastonbury four days afterwards, but now I'm back and getting into it, I'm feeling good about it. Fingers crossed that I won't get made redundant or fall out with my boss or have my contract unceremoniously ended due to management changes. Anyway, now the busyness is dying down, I have a whole backlog of blogging to get through. Expect July to be verbose. Stuff happened in this book. What stuff? Well, um. Um. A disappointing ending. This book changed a lot of essential qualities of the characters, and made them less likeable and believable. One of the best things about the first book was the group of misfits banding together and standing up for what is right, against all the odds, and succeeding, damnit. This had an altogether more hopeless message. Basically, a pointless sequel to the excellent Glass Books of the Dream Eaters, with a crappy and depressing ending and it took me freaking months to read as it was so non-engaging. And I read fast, you guys. The following books? All read in the month of June, except the last one. Srsly. The last three weeks, even! In comparison, I read this in an afternoon! Sophie Kinsella is so good at chick-lit, because she has that ability to inhabit the voice of what seems like a very real character. I know Becky Bloomwood. I kind of am Becky Bloomwood. It's total fluff, but so much fun. I want the other sequels now. I read this just before seeing the film, and it was interesting to see how the film combined the plots from both the books. I'm interested to see if anything from the other books made it in. The film is good, though, you guys. A cheesy girly romcom of no artistic merit whatsoever, but Isla Fisher is so damn cute and charming, and Hugh Dancy is so damn hot (totally a young Colin Firth, right?) and honestly, what's not to love about a film about shopping? I think staying so faithful to the source material was probably the biggest strength of the film. GROUND-BREAKING LITERATURE. Okay, not so much. The Twilight saga is rubbish. It is. However, it's so very readable. And actually, I thought that this was the best of the bunch so far. Stuff... HAPPENS. Like, all the way through! Instead of spending the bulk of the book writing about staring into someone's eyes and then in the last ten pages being suddenly all 'AND THEN A VAMPIRE ATTACKED!' it was all 'WEREWOLVES! ITALIAN VAMPIRES! REDHEADED VAMPIRES! AAAHHH! TEEN MARRIAGE!' Yes. But, y'know, still rubbish. Bella is such an annoying character. She dies at the end of the last book, right? RIGHT? I've had this book for ages. I was supposed to read it at uni and didn't, which was kind of how uni worked. Who can read five books in a week, every week? Not even exciting books half the time! But anyway, I kept reading recommendations for it, so I took it on holiday with me and, yeah, I really enjoyed it. I didn't think much of the ending, and as a friend said, it's very apparent that no one finds Dave Eggers as interesting and hilarious as... Dave Eggers. But I still enjoyed it, I'd recommend it to a friend, but it wouldn't be in my 'OMG YOU MUST READ' recommended lists, and it wouldn't be a book I'd give as a present (I always give books I love as presents. I bought like four copies of I Am The Messenger by Marcus Zusak at Christmas to hand out to people... an excellent book, by the way). I realised that I was going to finish AHWOSG halfway through the flight home from Turkey (in fact, it was about half an hour in) so at the airport I decided to buy a magazine. But they were like FIFTEEN EUROS. I am not even kidding! So instead I looked at the books, which were cheaper for the most part. This was still double what I'd pay on Amazon, but it was better than having nothing to read. And it was good! A selection of essays about his life and family, and very easily written, easy to read. A good plane book, definitely, nice and easy to dip into. I'll definitely be checking out more of his work, I really like his voice, and also how he's quite unapologetic about being kind of an irritating, judgemental human being. Instead of making him unlikeable, it actually made him more likeable. To me, at least. I bought this about a year ago after reading and enjoying Running With Scissors, and then it sat on my bookshelf for an age. I finally tackled it on the long car journey to Glastonbury, and it was... okay. Probably unfortunate that I'd just finished the David Sedaris book, as this was in a similar structure, and not done as well. Just as Sedaris, for all his flaws, is really likeable, Burroughs isn't, as much. There's a superiority about him that makes it hard to warm to. A suggestion that he is a really, truly great writer, when I've yet to see anything that suggests he's anything other than a 'good' writer. I've constantly been told that I'm a really good writer, but if I went around saying, 'Well, throughout school, I was treated as something of a prodigy due to my Talents...' you would be all like, 'This girl looooves herself, and it is not catching!' (Truth: Was not treated as a prodigy, but had many encouraging English teachers over the years, and friendly Livejournal commenters since then.) This is also why I do not enjoy the novelization of Devil Wears Prada. So, my overall opinion of this book is: Meh. The stories were readable, and sometimes interesting, but all too often I was left wondering what the point of a story about how great English crisps are (it's true, they really are) or wrinkling my nose at his 'deep' final setence that didn't fit with a frivolous story about how he likes dogs. I've had this for a year and have only just looked at it. I read most of it on a trip to Brighton over this weekend and it was okay. Easy to read, but as I'm a fan of the TV series, I spent most of the book comparing it. Unusually, the TV series is better, significantly better. I think the characterisation needs an actor to bring it to life, rather than just words on a page. However, I was impressed how the descriptions in the book of the characters like LaGuerta, Doakes and Deb matched their depictions on the screen. There were a few changes in the book, though, especially the end - part of the twist in the TV series is left out in the book, and the final pay-off is more drawn out in the TV show. 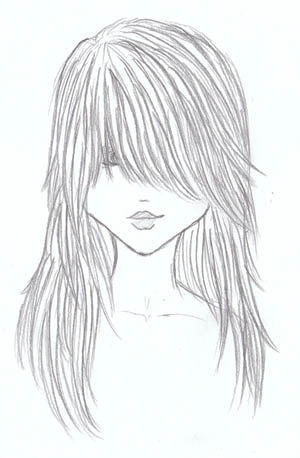 And better. I was slightly disturbed how Dexter kept mentioning how attractive his (albeit foster) sister was. That was just weird. Probably the second Dexter book, Dearly Devoted Dexter, but after that, I have no clue. Maybe Wicked - the novelisation of the musical (I have no clue which came first), or maybe Abssolute Sandman... I have books 3 and 4 waiting to be read. They're not exactly transportable, though. As soon as I get paid, I'm going on a major book binge on Amazon. Any recommendations? GLASTONBURY!!! - an unneccessarily long post. Actually, the weather was pretty good - it rained on Thursday, making Friday a day for wellies, but after that it got all hot and the mud dried up and by Sunday, it was totally flipflop weather! But then at about 1am on Sunday there was a monsoon, which I got caught in and it resulted in my phone getting drowned. This happens to me a LOT. Here are my Glastonbury Highlights:Lady Gaga! She's batshit crazy and incredible. I wanted to youtube her acoustic version of Poker Face, but the BBC said no. Little Boots! She's sparkly and tiny and adorable! You need to buy her album! It's like if Kylie was still good! 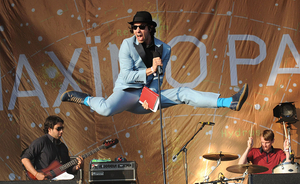 Paul Smith's (Maximo Park) pelvic thrusting and reinforced crotch! Being in the middle of a huge crowd all singing 'Tender' by Blur. I may have cried a little. 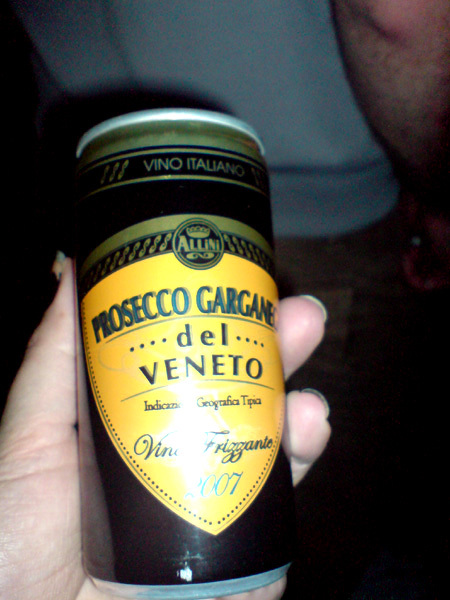 CANS OF FIZZY WINE. Lidl, I love you. I did two things differently this year from normal.1 - I lived in dresses. Normally, I wear jeans to festivals, and then inevitably get caught in the rain and they take four years to dry because the material is so thick, and the bottom of the jeans gets all encrusted with mud so by the end of the festival you're all out of clean clothes and are forced to push your foot through the bottom of your jeans which are entirely stuck together with mud and GOD. It's awful. The benefit with dresses and skirts is that they don't really get close enough to the mud to suffer, and you can change your tights if they get muddy or rain-soaked, you can layer up if it's cold and also, short skirts, tights and wellies actually looks pretty cute. This also goes for shorts, but I do not have the legs or bum for shorts. So, yeah, not only is this practical, but I also felt way less gross this year than ever before, because everyone knows that as soon as you put on a sundress, you feel instantly prettier. Add an array of coloured eyeliners and you'll be totally hot, even when you haven't showered in five days.2 - I straightened my hair. My hair is naturally curly. So, in the past, I've gone off to Glasto with it all curly, and haven't brushed or washed it the whole time, and by the end of the festival it is normally looking pretty dread-lock-esque. Not cute. Anyway, so this year, I decided to experiment with straightening it, because I figured that I could use dry shampoo, and plait it, and stuff. And I did! I'm still not convinced about dry shampoo, to be honest, I can't see that it makes MUCH difference to my hair, but it was still nice to brush it. Also, it meant I could do cute hairstyles with plaits and things, and wearing it up for the bulk of the festival meant that by the time Saturday and Sunday rolled around and I took it out, it was all clean and smooth and nice. Hurrah! Considering what a photog I've been lately, I didn't take very many photos this year at ALL, which makes me sad. The spare battery I bought for my cameraphone didn't work so I was preserving battery for attempting to stay in touch with people. Check out my friend Russell's photos on his Flickr, though. Or my Day in a Life from last year. Doesn't it look awesome? You should go! But give me a chance to get my ticket for 2010 first, okay? What festivals are you going to this summer, or, what festivals have you always wanted to go to? My vote goes to South by Southwest in Texas. One year I will go! Erin always makes it sound so awesome.